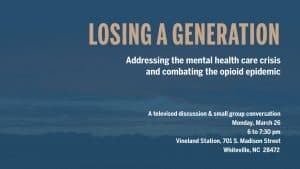 “Losing a Generation: Addressing the Mental Health Care Crisis and Combating the Opioid Epidemic” was a televised conversation and community forum that discussed some of the most pressing issues in Columbus County, North Carolina. This event was a follow up on The News Reporter and Scalawag‘s six-part series investigating mental health and addiction care in our community. The first 30 minutes was a short series of conversations broadcasted on UNC-TV available below. Afterward, there were several round table conversations in small groups about how mental health care and the opioid epidemic affect education, policing, and more. Participants discussed potential paths forward as well as what other important topics The News Reporter and Scalawag need to cover next. For more information, be sure to read, “How A Nonprofit Magazine And A Community Newspaper Worked Together To Cover The Opioid Crisis In Rural North Carolina” published in Scalawag Magazine. This event was made possible thanks to funding from PEN America’s Press Freedom Incentive Fund.